Ralph Hayes' 'Stoner' series kicks off with 1976's “The Golden God”. Like a majority of the author's work, it was released by publishing house Manor (which questionably may have been a tax dodge for Belmont/Leisure or a Mafia money laundering scheme). Regardless, the Hayes/Manor combo was a successful one for genre buffs and fans, producing nearly 25 titles that are still discussed nearly 40 years later. Along with series' like 'Buffalo Hunter' and 'The Hunter', 'Stoner' introduces another hefty dose of bravado in Mark Stoner, a treasure hunting exporter that is just damn good at everything. This novel in particular is a bit pulpy, capturing exotic jungles, ancient ruins and cursed relics. It's all plot bait to set-up Stoner versus a bunch of baddies. Oddly, the synopsis on back of the book mentions an Erik von Richter. There's no character by that name in the book. Instead, this Richter guy is actually Johann Strasser. I'm not sure if this was a late edit of the name or just a major miscommunication from the editor to artist. Regardless, the book has esteemed archaeologist Strasser acquiring a small Peruvian golden statue (The Golden God) called the Cuzcapac. I'm calling it “Goldie” for the sake of simplicity. The prior owner, an Indian named Idilio, is killed off by a duo named Diablo and Maltese, so it's just a matter of time for the next owner to be hunted and killed. The evil exporters are after Goldie and soon make a play on Strasser. Not only do they want Goldie's riches, but also the location of ruins where the statue was found. Big money, big money, no whammies. Before Strasser is inevitably murdered, he passes Goldie to Stoner in Key West. 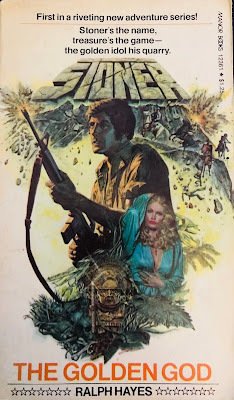 With the treasure and a semblance of where the ruins are located in Peru, he travels to Buenos Aires to hook-up with Strasser's attractive daughter Ursula. Together, the two strike a bond and travel into the Peru jungles to locate the ruins. Maltese, Diablo and some goons simultaneously strong-arm their trek to the ruins, setting up the impending confrontation for the last 10-pages. Hayes is a meat and potatoes writer and “The Golden God” emphasizes that. At 180-pages of exotic adventure, soldiers of fortune and buried treasure, Hayes delivers the goods. While the story-line is boiled down, the action is intense and moves at a rapid-fire pace. I read the book in a few hours and was thoroughly entertained. The book's sequel, “The Satan Stone”, is miles better than this, but the series grasps a good foothold here. Those looking for more pulp adventure will find plenty to like in this series.